This is a revised Public Notice of Tompkins County's Section 5311 Rural Transportation Grant to NYSDOT. The budget and application files are shown below. he Ithaca-Tompkins County Transportation Council (ITCTC) gives notice it is soliciting proposals or ideas from agencies, service providers and members of the public for improving transportation services for seniors or people with disabilities in Tompkins County as part of the Coordinated Human Services-Transportation Plan. The Enhanced 5310 Program replaces the former Section 5310 Seniors and Individuals with Disabilities and Section 5317 New Freedom Programs of prior years. New York State Department of Transportation administers the Enhanced 5310 Program. Projects must be included in the Tompkins County Public Transit & Human Services Transportation Plan to be eligible for funding. Therefore, this is a project solicitation for new or continuing projects to be included in the Plan as approved by the ITCTC. Eligible applicants must be private not-profit (Section 501(c)(3) corporations or Tompkins County. Applicants can ask for funding for two years - 2014 & 2015. Annual funding is estimated at $130,409 for 2014 and 2015. The actual amount will change depending upon annual appropriations in Federal Budget laws. A minimum of 55% or ($71,725) per year is set aside for GADABOUT Transportation Services, Inc., as a former subrecipient under the old 5310 program. GADABOUT may apply for more than the minimum set-aside. There is a local match required for each type of project. Send proposals to Fernando deAragon, ITCTC, 121 E. Court St, Ithaca, NY 14850 or by email fdearagon@tompkins-co.org before 4 pm on Nov 7, 2013. The proposal form can be dowloaded below. What is the Coordinated Transportation Plan? The overall idea is to use a large family of transportation services (including public transit (TCAT), demand response service (GADABOUT), taxis (Ithaca Dispatch), Ithaca Carshare, rideshare (ZIMRIDE Tompkins), volunteer driver services (FISH), education (Way2Go) and 24/7 phone support (2-1-1 Tompkins/Cortland) to enable people to make informed transportation choices. Each year the Coordinated Plan is amended to publish changes to goals and objectives and to allocate Federal transit funding to specific projects. In August and October public notices were published asking for proposals to be submitted that best fulfill the goals and objectives in the coordinated plan. This public notice is asks for public comments on the proposed projects. What is the 2013 Amendment? 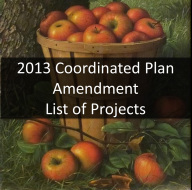 The 2013 Amendment includes a list of proposed projects by funding program for 2014 and 2015. A total of $620,494 in Federal funding for projects would be used from existing grants or new grant opportunities in 2014-15. The FTA Sec, 5310 Program, solicited projects for 2014 and 2015. The Special Community Mobility Program lists projects for 2014. Furthermore, the amendment includes the Way2Go Program for 2014, operated by Cornell Cooperative Extension of Tompkins County under contract with Tompkins County. The amendment can be viewed or printed from the window below or downloaded using the link below. How to comment on this proposal or receive more information? Please use the comment form below to submit a comment or question about the Coordinated Plan, amendment, a project, or community transportation needs. You can send a fax to 607-274-5666, call Dwight Mengel at 607-274-5605, or send a letter to Dwight Mengel, Tompkins County Dept of Social Services, 320 W Martin Luther King Jr/ State St., Ithaca, NY 14850. Comments must be received by Dec. 7 for consideration at the I-TCTC Joint Planning & Policy Committee meeting on Dec 17, 2013.
for inspection on this webpage. Tompkins County will accept comments on the goal for 45 days from the date of this notice (9/26/2013). Pursuant to you letter of August 29, 2013, I have revised Tompkins County’s Disadvantaged Business Enterprise (DBE) triennial goal setting methodology by combining the goals provided by our subrecipients - Tompkins Consolidated Area Transit, Inc. (TCAT) and the City of Ithaca, for its SGR Construction Project (Project ID# D2012-BUSP-155). The combined DBE goal for FFY 2014-2016 is 3.8%, which is a weighted average of the two goals shown in the table below. May 24, 2013. See the notice below.